Angler's Ray and Brad with 185 lb Blue Marlin and 34 lb Ono! Mahalo to Angler’s Ray and Brad for choosing Maggie Joe Sport Fishing! The pair spent the day on a sport fishing charter aboard the Sea Hawk with Captain Darryl. Ray hauled in this 185 lb Blue Marlin while Brad brought home this nice 35 lb Ono while deep sea fishing outside of Honolulu, Oahu. Congratulations and aloha! 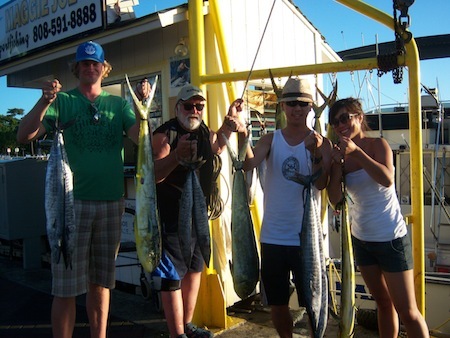 Ashley, Marcus, Nigel, Steve, Karen and Julio with 2 Mahi Mahi and 3 Ono! 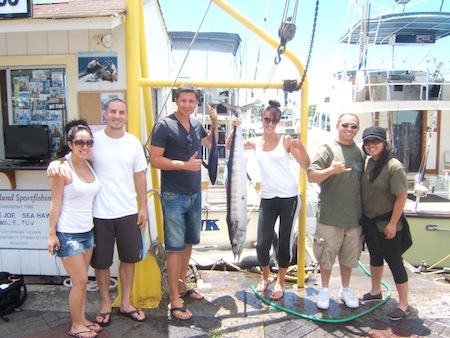 Mahalo to Ashley, Marcus, Nigel, Steve, Karen and Julio for choosing Maggie Joe Sport Fishing! The group hauled in 2 Mahi Mahi and 3 Ono while deep sea charter fishing outside of Waikiki, Oahu! Mahalo for the fun and enjoy the fish! Thomas and Jacob with 2 Mahi Mahi and 1 Ono! 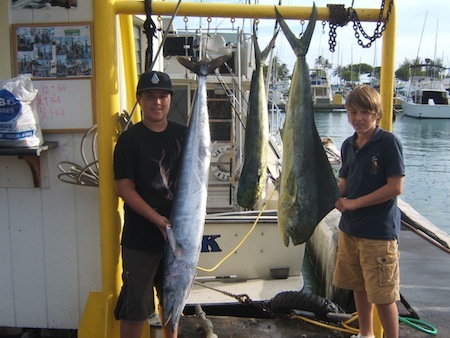 Thomas and Jacob joined us aboard the Sea Hawk on 8/15/11 for a full day sport fishing charter. A great time was had by all as the boys hooked up with and reeled in 2 Mahi Mahi and 1 Ono while deep sea fishing outside of Honolulu, Oahu! 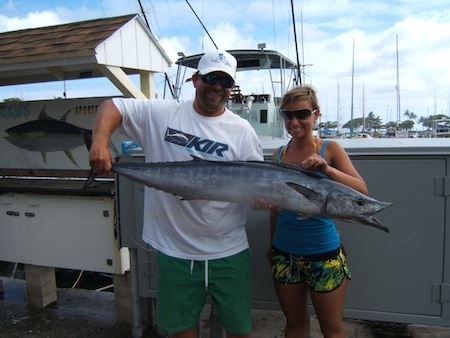 Mahalo for choosing Maggie Joe Sport Fishing and hopefully we’ll see you out on the water again! 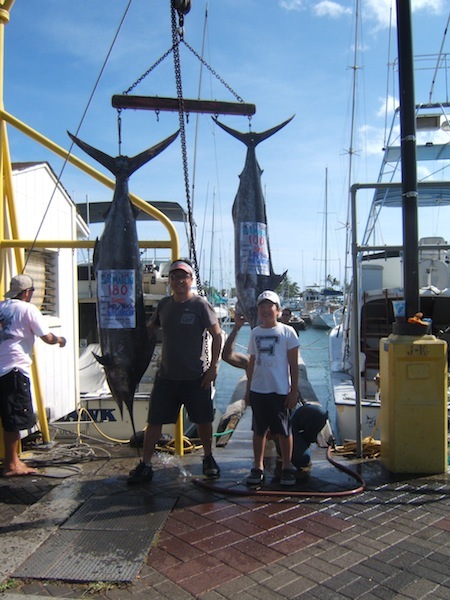 Sam and Alec with 180 lb and 100 lb Blue Marlin and Ono! Capt Nick, Ryan, Takayuki, Tim, Capt Dan, Alec, Sam and Brendan with 180 lb and 100 lb Blue Marlin and 1 Ono! It was another good day here in beautiful Honolulu, Hawaii! 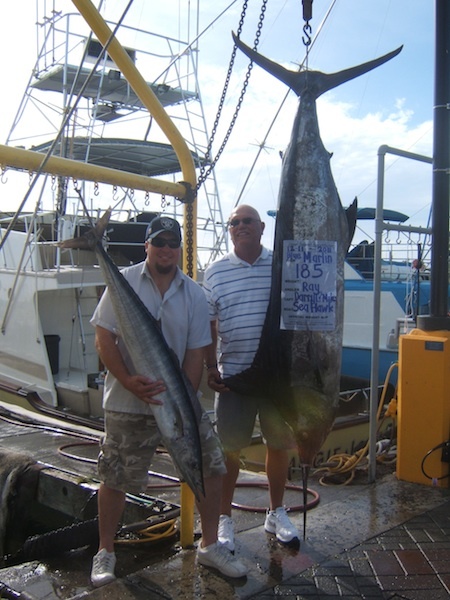 Captain Nick and Dan did a great job finding the fish on 8/9/11 during a full day sport fishing charter. 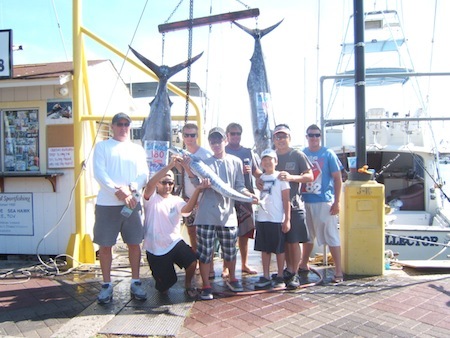 Ryan, Takayuki, Tim, Sam, Alec and Brendan… Mahalo for choosing Maggie Joe Sport Fishing! The group hauled in a 180 lb Blue Marlin, a 100 lb Blue Marlin and 1 Ono while deep sea fishing outside of Waikiki, Oahu! Great job guys! Aloha! Glen with 40 lb Ono! 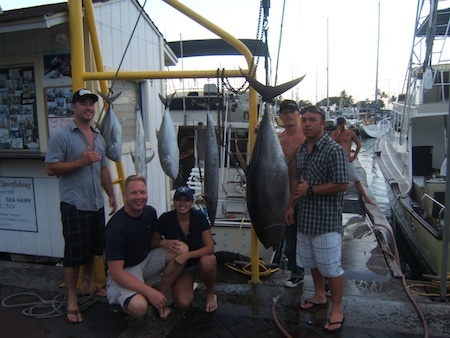 Mahalo to Chris, Brad and Glen for choosing Maggie Joe Sport Fishing! The group departed Kewalo Basin, next to Waikiki, aboard the Bill Collector on a sport fishing charter. The guys had a great day as they were able to haul in a nice 40 lb Ono, a Mahi Mahi and a handful of Aku while deep sea fishing outside of Honolulu, Oahu! Aloha! 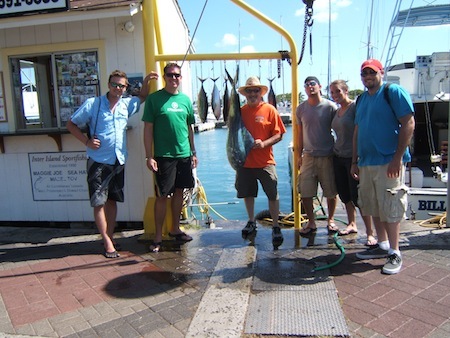 KC joined Mate Bill and Captain Matt aboard the Ruckus on 7/9/11 on a sport fishing charter. 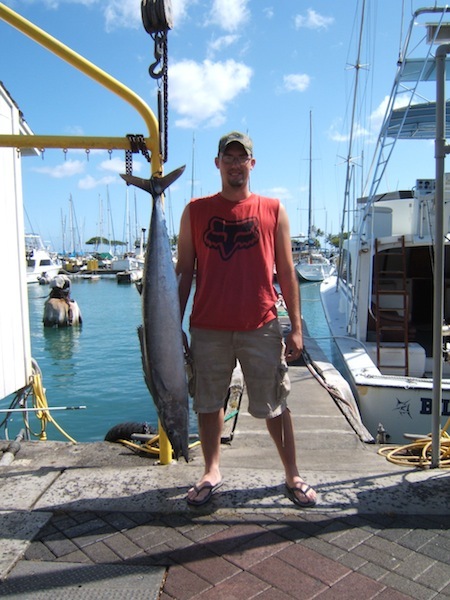 KC reeled this nice 35 lb Ono in while deep sea fishing outside of Honolulu, Oahu! Aloha! Vadim, Kathy, Hussein and Chiqui with catch! 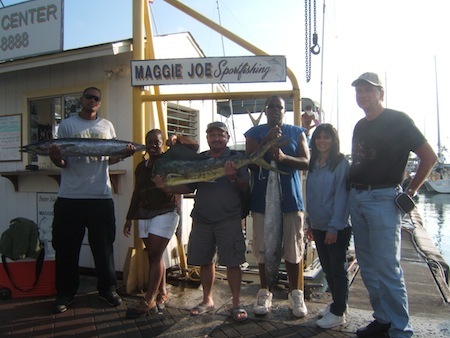 Mahalo to Vadim, Kathy, Hussein and Chiqui for choosing Maggie Joe Sport Fishing. The group departed Kewalo Basin, next to Waikiki, on a half day afternoon sport fishing charter aboard the Sea Hawk with Captain Morgan and Mate Kevin. 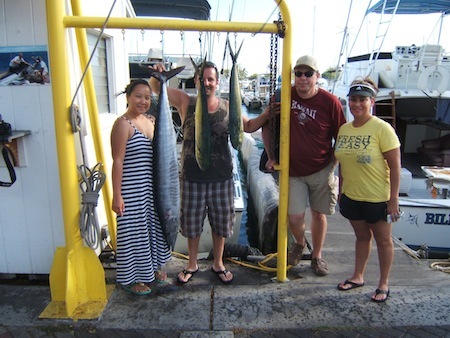 The group hauled in a pair of Mahi Mahi and a nice Ono while deep sea fishing outside of Honolulu, Oahu! Great job and Aloha!